When jumping from some height on your bare feet, you try to damp the impact by flexing your knees, until the shock is fully absorbed. In bigger jumps, you will end up with your hands on the ground or rolling forward. 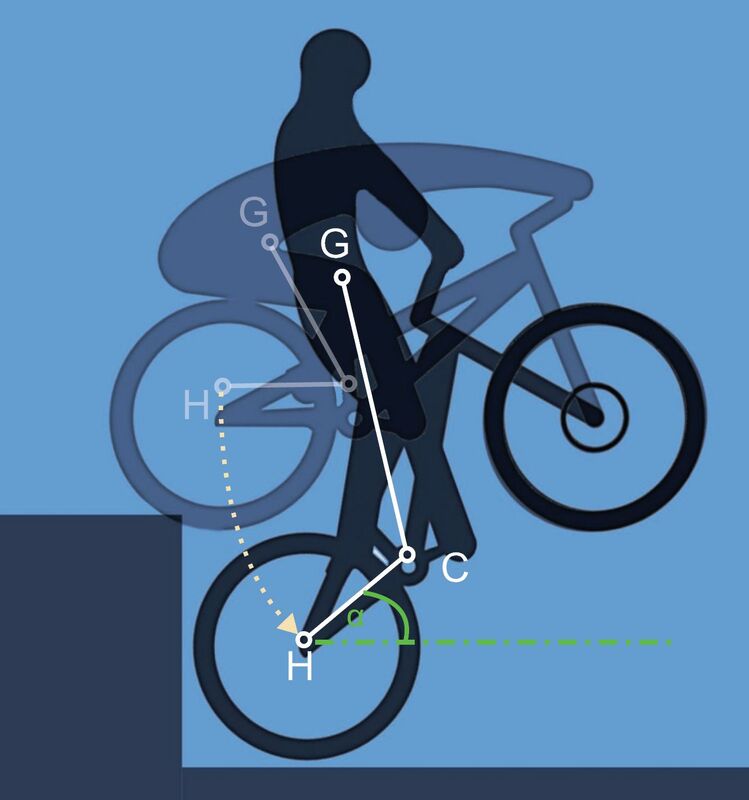 If we consider your centre of gravity (a virtual point G on which would be concentrated all your mass), it combines with the bicycle frame into the knee-like mechanism defined by the levers G-to-C and C-to-H; where H is the axis of the rear hub, and C is the crank axis acting as an articulation. Just before impact with the ground, you should be fully stretched, with G laying forward, thus opening the G-C-H structure to create maximum shock absorption potential. When the back wheel hits the ground, you will absorb the impact by shifting your weight backwards, controlling the rate of this transition with your arms and legs. That brings G down and backwards, folding the overall structure and progressively absorbing the shock. For illustration purposes, let's imagine three different behaviours on the bike with the respective displacement curves 1, 2 and 3, each corresponding to the paths of the rider's centre of gravity G relative to the crank axis C and to the rear hub axis H.
Each curve corresponds to a different combination of forces exerted by your arms and legs. 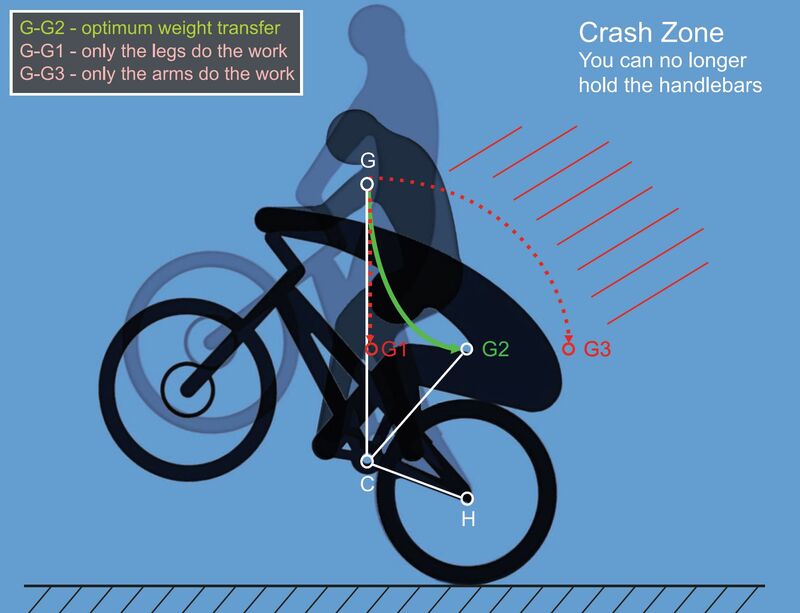 On the graphs, G is taken as the initial position of your centre of gravity corresponding to a maximum extension on the bike before landing, finishing the move with your centre of gravity positioned either at G1, G2 or G3. The green curve for your center of gravity shows an optimal weight transfer for the best shock absorption. Curve 1 shows no weight shifting backwards, only your knees and legs will absorb the shock, the G-C-H structure doesn't fold. This is not good! You could virtually land with your hands off the bars, but all your weight coming down on the cranks will slam the bike flat onto the ground. You would still need to absorb the impact as if you were jumping on your bare feet (obviously not the best option, as the bike is still in your way and may upset some precious flesh). 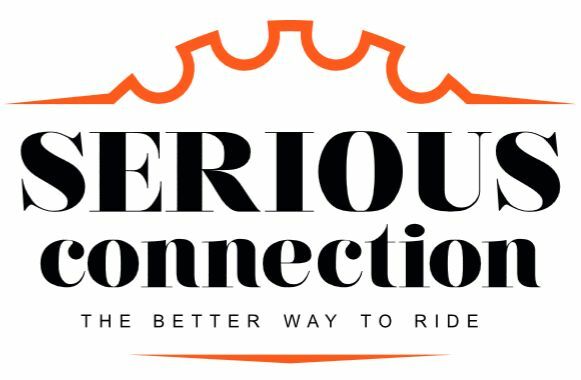 Curve 3 illustrates the opposite extreme, keeping your legs straight. That's not good either! All the damping action is concentrated into your stretched arms, you'll be ejected backwards simply because you won't be able to hold the bars when your centre of gravity reaches G3. Now, the green curve (III) in the middle illustrates the ideal combination of your legs and arms' efforts to fold the G-C-H structure. In curve III, G ends up a bit further from C than it actually passes by it. That is because the weight shifting first starts with the knees folding under the legs' control, before the arms take the relay by a controlled extension. It ends up just above H, which means that you are perfectly balanced on the back wheel after landing. A straight line between the points G and III would be in the case of an equal load control in the arms and legs, which isn't ideal, because the legs are much stronger and should bear most of the shock absorption. Above the ideal curve, there is more than necessary load in the arms, whereas below this curve, the impact is mainly absorbed in the legs. The angle alpha (H-C to horizontal) should be between 10° and 30°, leaving you with some margin for the balance, and avoiding to bang the front wheel on the ground. If alpha= 0°, then you'll land flat. You can still do the correct move relatively to the bike, but you'll take some of the impact directly into the wrists (avoid that). Also avoid alpha < 0°, landing on the front wheel is hardly pleasant. By blocking the back wheel, you'll get a longer lever on the rear, tyre touch-point to crank axis, instead of the H-to-C lever, which means even more shock absorption. The tyres add some damping, but it's no big deal, 2" travel at most. Use our Crash Calculator to compute your speed of impact with the ground depending the drop's height.